Products – Memory – Xtreem SDHCSDXC UHS-I U3 – Team Research Inc. 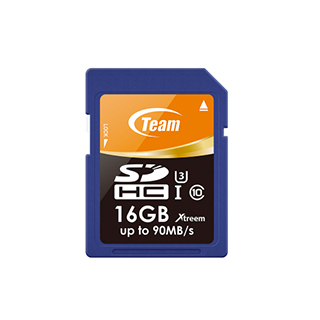 Team Xtreem SDHC/SDXC UHS-I U3 Class10 memory card series complies with the new generation SD / microSD memory card specifications-UHS-I U3, and has further increased the minimum writing speed to 45MB/s ; it is able to provide smooth high definition recording qualities when used with cameras and handheld devices that supports UHS-I. Team Xtreem SDHC/SDXC UHS-I U3 has reading and writing speeds up to 90MB and 45MB respectively, and has a super large 256GB (SDXC) capacity, allowing professional photographers to record and take Full HD, 3D and 4K videos and photos with no worries.